Whether oregano, chilies, coriander, cinnamon, thyme, or even tea, spices add incredible dimensions to what would otherwise be plain, ordinary meals. 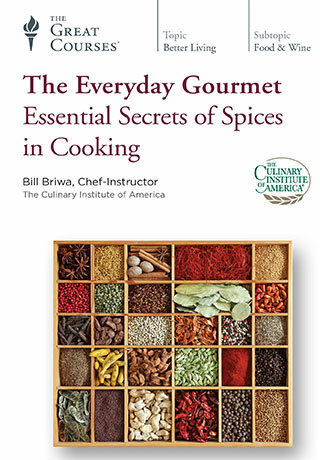 In The Everyday Gourmet: Essential Secrets of Spices in Cooking, join Chef-Instructor Bill Briwa of The Culinary Institute of America as he reveals the essentials of incorporating a variety of spices from around the world into your everyday meals. An aromatic array of spices fills each of these six engaging lessons, providing you with ways to use spices in soups and salads, with meat and fish, and even in drinks and desserts. Filmed on location in the kitchens of the CIA’s Greystone campus in Napa Valley, these lessons are rich with insights that are sure to take your cooking to the next delicious level.